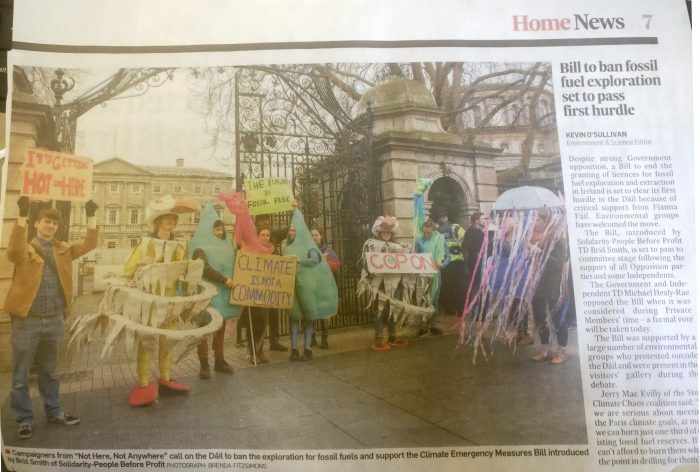 The Stop Climate Chaos Coalition has described the Dáil vote in favour of the Climate Emergency Measures Bill on the 8th February 2018 as “historic”. The Bill, proposed by People Before Profit TD Brid Smith, would end the issuing of licences to explore for oil and gas in Irish waters. It passed the second stage debate and was referred to the Climate Action Committee by 78 votes to 48, with cross-party support emerging to overcome Government opposition to the Bill. “Leo Varadkar put his Government on the wrong side of history today. The Government clung to the past but they lost. Dáil Eireann voted to take another step towards a fossil fuel free future. “There is no time to lose in the fight against climate change. We hope the Government will come on board and help see this important piece of legislation through as quickly as possible. If passed, it will be one of only a handful of laws like it internationally – a rallying call to others to act. “Today’s vote once again shows the potential of new politics to produce positive, progressive results in an empowered parliament. The veto power not only of government but of the civil service has been broken. A more open, deliberative, and collegiate legislative process is slowly taking root. 1. Details of the Bill are here. 2. The Stop Climate Chaos briefing on the Bill and the issues it addresses are here.